Welcome to Health Information Translations! This website provides plain language health education resources for health care professionals and others working in communities with limited English proficient populations. Health Information Translations has been an award winning resource since its conception in April of 2005. Below are just a few of the honors the website has received for its translated health education resources. Publication in American Nurse Today, suggested citation: Moyer, DC, Guthrie, K, & Wingert, BJ. (2012). It's all in the translation. American Nurse Today, 7(5), 50-51. The U.S. National Library of Medicine's MedLine Plus website links to over 2300 Health Information Translations documents. Institute for Safe Medication Practices (ISMP) Recognition for actions that have set a standard of excellence in the prevention of medication errors. December 2008. Trinity Health Excellence and Innovation Award for Outstanding Achievement in Support of Community Benefit Ministry. November 2007. Cancer Patient Education Network Excellence in Cancer Patient Education. October 2007. Health Care Education Association, Honorable Mention, Patient Education Excellence Award. October 2006. Multicultural Center Award for Outstanding Program. The Ohio State University. May 2006. Columbus City Council Certificate of Honor and Recognition. May 2006. Trinity Health Excellence and Innovation Award for outstanding achievement in Mission Integration and Advocacy. November 2005. Health Education Excellence Award, Community Health Education Team Award, The Ohio State University Wexner Medical Center. October 2005. Health Care Education Association, Excellence in Practice Award to Diane Moyer in recognition of innovation and effective practices in Patient/Community Education. October 2004. When a topic is selected for development, a team member pulls available materials from the inventories of the four partnering health systems on that topic and an evidenced-based literature search is done. A new draft is created. An initial review is done by at least one of the health education specialists to streamline the content and adjust content flow. Changes are drafted and the document's reading level is calculated using the Fry Formula. The team edits the content, focusing on overall flow of the document and readability. Any illustrations needed are identified and secured. The material is sent to a clinical expert for review to ensure that key points were not omitted and to check that the content remains correct. The clinician's comments are reviewed by the team and incorporated as appropriate. 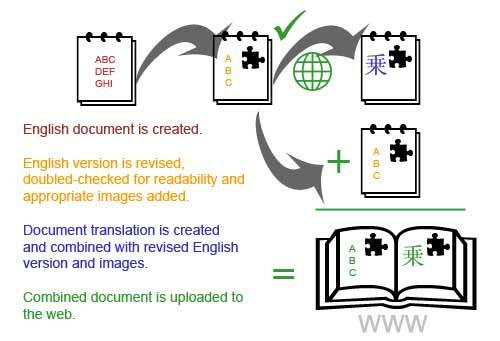 Illustrations are added if applicable and then the document text is sent for translation. Translated documents are returned and posted on the website for access. Documents are reviewed and updated at least every four years to maintain currency of content. Documents due for updating follow a similar lifecycle prior to being updated online. A contract service is used to translate resources on this website. Resources are translated from English to the foreign language, back translated to English, edited and proofread by different individuals as a quality control standard. At least a bachelor's degree in the field or specialty they are translating. If they are from outside the U.S., they must have a translation certification. Those within the U.S. must show completion of translation training in particular language(s). If these minimum qualifications are met, they undergo linguistic testing and training. The contracted service is a corporate member of the American Translators Association, and they are an authorized translating firm. This website was established to share translated health education resources, predominantly for Limited English Proficiency (LEP) populations. This is a collaborative project of the four health systems in central Ohio: The Ohio State University Wexner Medical Center, Mount Carmel Health System, OhioHealth and Nationwide Children's Hospital. Our goal is to provide culturally appropriate materials to promote health education and wellness among populations who may not speak English as a primary language. What does the website provide? Resources are reviewed and updated as needed or at least every four years. How are items selected for translation? The topics are identified by clinical experts within the four partnership health systems providing care to populations within Central Ohio. Topics are selected based on need and practice standards, depending upon available funding for translations. Additional languages and resources are added to the website as grant funding becomes available. Support from the partnerships' four health systems and donations cover the maintenance costs of web fees and the updating of resources on the website. We continue to seek additional funding to expand and update the inventory of materials we make available on this website. Who can I contact for more information about this website? Each of the website's team members would be happy to address any other questions you have related to this website. Please use the online contact form. Health Information Translations gives thanks to these organizations for their willingness to support the development of translated health education resources. Health Information Translations welcomes collaborations with organizations who seek to develop new resources. We are thankful for these partners who have provided expertise and/or funds for translated resources. Health Information Translations welcomes your financial support. 100% of funds donated are used to cover the costs of translation and illustration fees to update and expand the inventory. If you are interested in making a financial contribution to support this website, you are able to do so by mail or online. Translated resources on the website are very expensive to maintain. Without the support of users like you, this site may not be able to continue. Please specify the donation is to go to Fund # 311822 Partnership for LEP Patient Health Education.